So, after my surgery in September, my goal was to start running before the first snow fell here in New Hampshire. I’m now on my third week back to running, no snow, and I’m feeling even better than I did before my surgery! Since I was not able to do a lot of aerobic activity, and couldn’t (still can’t – but soon) lift weights, I relied on a lot of body weight strength exercises for my legs. I feel like they’ve done me a lot of good, so I’m keeping them up! Once I’m able to do work with my arms again, I will add in a day of arm strength a week too. Eventually I’d like to join a gym again and get myself TOTALLY BUFF. It’s made me so happy to be back to running. It’s something I never thought I would enjoy, but I do, and I’m happy for it. I don’t like being out in the cold much, but since I hate treadmills more (I have weird balance which makes me fall off of them. A lot. ), I’m trying to get myself a nice base of colder weather running clothes. EMS Thunderhead Rain Jacket– This thing is great. It has armpit vents and a hood with a bit of a brim on it, and it’s very lightweight. I considered just running in the rain with a trash bag on me, but I think this was worth the money. Went back and bought one for Paul for his birthday month (yes, birthdays last a whole month around here). EMS WindBlast Vest – Also great! I wore this on Sunday for a quick 2 mile run. It was about 45F out with 12mph winds. I put this vest on over my shirt and my core was so very comfortably warm. So happy! I probably could have worn capris instead of shorts, but my knees weren’t cold for long. Also a birthday month gift for Paul, what a spoiled. C9 by Champion 1/4 Zip Jacket – I WANT TO WEAR THIS ALL THE TIME. I actually haven’t run in this yet, as I just bought it last night, but I tried it on and it is everything I want in a light running jacket. Vented armpits, a vented back, a pocket that zips (!!!!! ), and thumbholes. $39.99 is a little pricey, but I’ve seen jackets like this at the fancy running stores for double the price or more. Love love love. Next up, I plan on getting some cold weather tights that I can wear 30F or below. I have a pair of Saucony’s picked out, and I think they’ll do the trick. But if anyone has any suggestions, send them my way! Hooray! Yesterday was Halloween! And today I am sad because I have to wait a whole year for it to happen again. We started our celebrations early by heading to Rochester last weekend to visit friends and have fun. It was great! We got to hang out with friends, sleep in (!!!!!! ), go to a museum, eat sorbet/frozen yogurt with ENDLESS TOPPINGS, and drink lots of cider with whiskey. 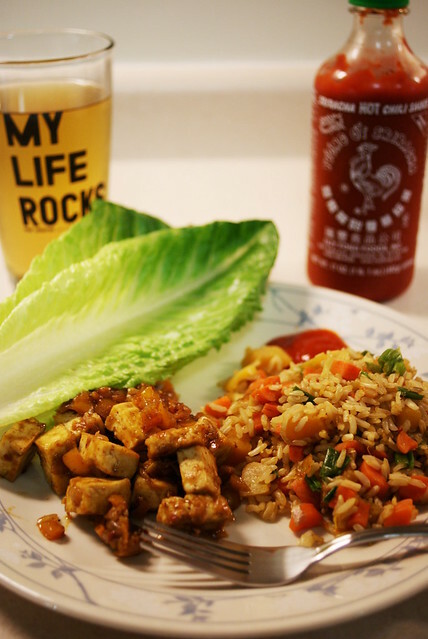 This is yet another meal from Appetite for Reduction, Unfried Fried Rice and Lettuce Wraps with Hoisin-Mustard Tofu. I’ve made the tofu before, and it is one of my favorite things. The rice was new. It came out perfect! I cooked the rice earlier in the day so it had some time to cool down before I unfried it, and it was wonderful. To bulk it up a little, I added some steamed carrots and butternut squash cubes. The butternut squash was a random thing and I wasn’t sure how it would taste. It worked, though! It gave a little bit of sweet, and the added sriracha added heat. So good. We were back in New Hampshire for real Halloween, and I celebrated during the day by doing a Zombies, Run! mission on my lunch break. I had sore legs from weight training the day before, but I managed to evade the zombies anyway. Paul and I both had crummy days at work, so I wasn’t sure we wanted to do anything for Halloween night. But we managed to put our grumps away for a while, and headed out to Portsmouth. It was our first time there, but I had heard that they know how to do Halloween right. And they do! There was a Halloween parade going on, but we missed most of it. No worries, though, we had other plans. We headed for a quick bite to eat at The Friendly Toast, a diner-style restaurant that my friend Colleen had raved about. They have a decent selection of vegan-friendly foods, good beers available, and the most wonderful, kitschy decor. It wasn’t very crowded, thanks to people being too busy cavorting in the streets, so our food came quickly. 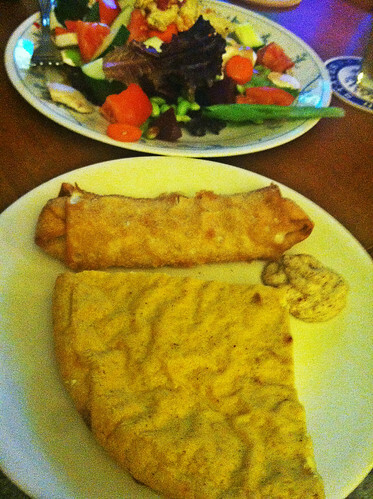 We both had the Vegan Valhalla – a burrito filled with brown rice, portobello mushrooms, and tofu. I had mine with home fries, which I was so glad to hear were not cooked using butter! Yay! Paul had sweet potato fries, and they were fantastic. 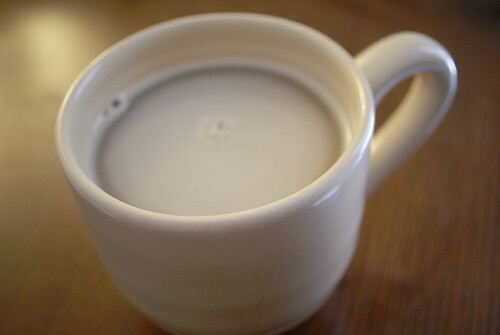 It was also nice that they had soy milk for the coffee. Yeah, it’s such a small thing. But Concord seems to not know that soy milk or any non-dairy milk drink is a thing. 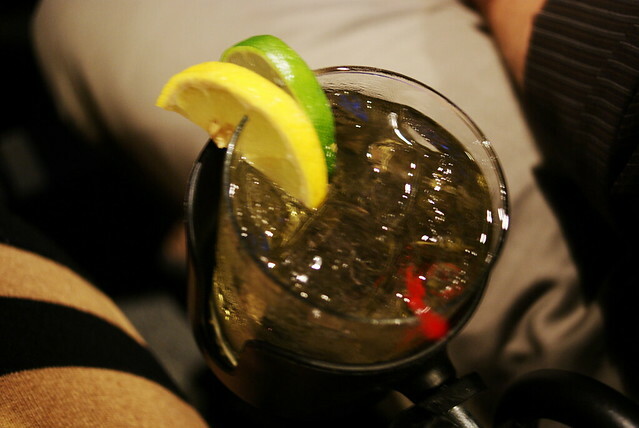 It was made of vodka, tequila, and ginger ale. Whaaaat? Tequila and ginger ale? I know ginger ale (or beer) goes well with a lot of liquors, but I’d never tried it with tequila. And well, it worked. Now, to make them at home. We had a lot of fun at the movie, people were really into it and I left feeling happier than I have in a while. Thanks, Portsmouth! Actually, an orchard gave me apples. Well, actually Paul gave an orchard some money in exchange for apples. When life just starts handing me apples, well, that will be a standout day. Last year we made enough applesauce to last us almost a year, even with giving some to family members. 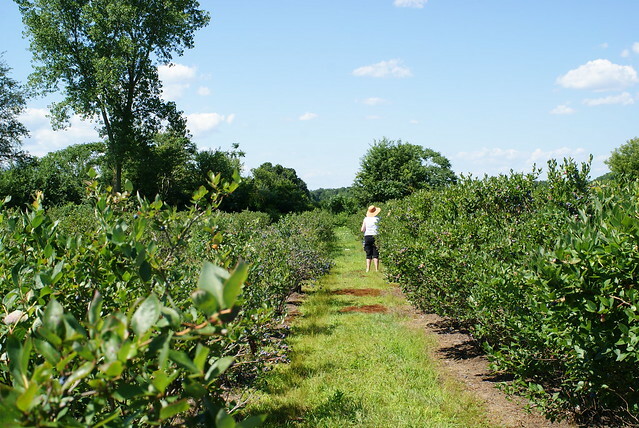 This year, family demand is up and New York State apple production was down. So we’re going to have to do this in batches. Canning is one of my favorite things to do. It’s fun, I’m good at it, and I like having cupboards full of foods that I’ve canned myself. 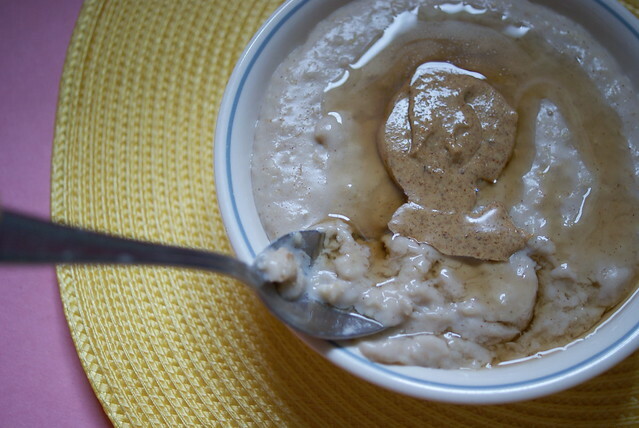 And applesauce is one of our favorites; we’ll eat it plain by the spoonful, warmed with rice whip on top, and swirled into oatmeal (my favorite). This is the recipe I follow, and is by no means a tutorial on canning. If you want to learn how to can, I suggest picking up a Ball canning book and reading some Cornell Cooperative Extension materials. Worked for me! 1) Prepare your canning jars according to your canning book/other materials. 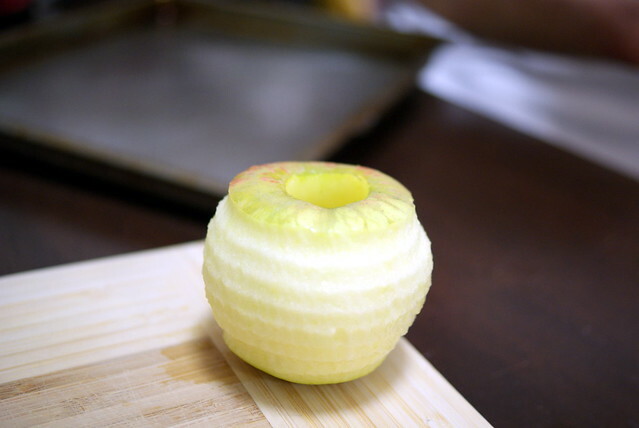 2) Peel, core, and quarter your apples. I make this easier by using a hand crank apple peeler, and a handheld apple corer. You could probably get one piece of machinery to do both operations at once, but I like my method. 3) Once all of your apples are prepared, place them in a large saucepan and add enough water to just cover the bottom of the pot. Cook over medium-high heat, bringing to a boil. Once boiling, continue cooking until the apples have softened. Some apples will soften faster than others. It probably wont take more than 30 minutes. Stir while the apples are cooking, don’t let them scorch or stick! 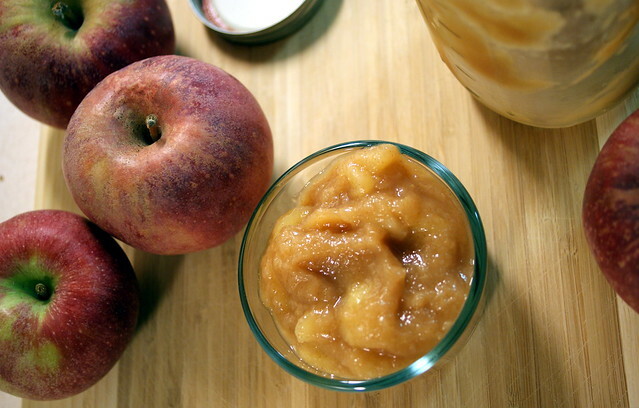 4) Blend half of the apple mixture so that it’s velvety smooth. Mash the other half of the apples so that they’re chunky. Mix the blended apples back with the mashed ones. 5) Add the lemon juice and cinnamon, and return to a boil. Let cook for five or so minutes. 6) Ladle the applesauce into prepared canning jars, and process according to what your canning book says (for the quart jars, I did ten minutes at full boil, then let them sit in an uncovered pot with the heat turned off for five minutes before removing from the canner). 7) Keep covered and away from drafts for 24 hours, then check to make sure the seals have set. If they haven’t transfer to the fridge and eat soon! This won’t be hard, but I’ve never had a jar not seal. I ate a bowlful when I came in from my afternoon run today. This was a momentous run. It was my first one back since I had my arm surgery (I was out for six weeks! ), and my run today took me over the 200 mile mark since recovering from my last surgery! I was pretty amazed that I put in nearly 200 miles between June and September (half marathon training is an amazing thing). This run was much easier than after my last surgery. My arms didn’t even hurt afterwards, which was nice! They feel a little puffy and swollen, but it’s not bad. My lungs though, they will need adjusting to breathing hard in this crisp fall air! This is really exciting, guys. Vegan nachos. I gave myself a belly ache with these things. I got so excited that I instagrammed my vegan nachos. 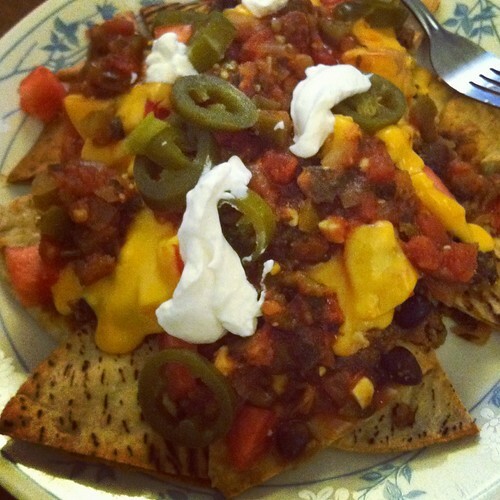 Then I frowned a bit because I got so excited that I instagrammed my vegan nachos. Then I ate them and I was happy again. There’s not a whole lot to this recipe. For my birthday, Paul bought me some Nacho Teese. I love Teese. I was holding onto it for a special occasion. This was it. 1) Preheat oven to 350F. Cut each pita into triangles, I got six from each pita. Coat a baking sheet with cooking spray, place the pita triangles on it, and spray with a little more cooking spray. Bake until crispy, about 10 minutes or so. 2) While the pitas are toasting in the oven, place the black beans, boca crumbles, 1/2 cup salsa, curry paste, and cayenne pepper in a small pot. Cook over medium heat until the crumbles are cooked through and the combination is thickened. 3) Heat your Nacho Teese in the microwave, until molten and awesome looking. 4) Assemble! 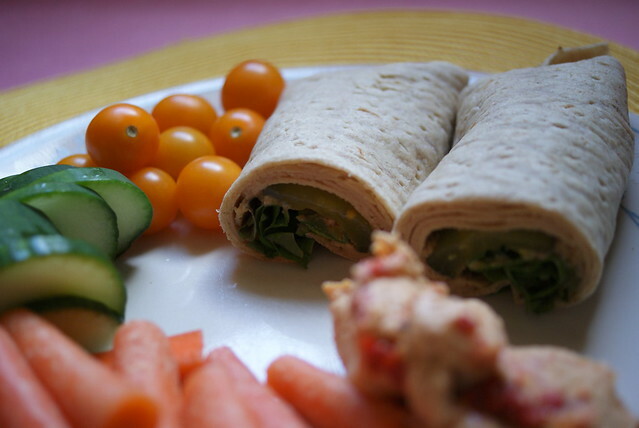 Place your pita wedges on a plate. Top those wedges with some of the black bean-boca mixture, some diced tomatoes, and your Nacho Teese. Top that with some more salsa, jalapeno slices, and some vegenaise (sounds gross? It’s good) and whatever else you might want to top it with. 5) Fuuuuuck. Eat that stuff. Oh hey there! I do a lot of What I Ate Wednesdays. I wasn’t going to bother this week, until I realized that I was running 12 miles on Sunday for my half marathon training, and I figured why not do a 12 mile run WIAW. Otherwise known as WIAWIR12MFTFT. Catchy! I tried to get a lot of calories in me before the run. We started out at around 5pm. So I had the whole day in front of me! Or I did, until we decided not to wake up until around 11:30-ish. Oh well. Long run day breakfast is pretty much always oatmeal. I cook my oatmeal funny. I add lots of liquid to it! For each serving of oats I add 1 cup water and 1 cup almond milk. Plus a little sweetener and cinnamon. Also usually some ground flax seed, but in my sleep overdosed state I forgot it. Then I cook it for a real long time! Then it gets glomped in a bowl and things get added to it before it is eaten. BAM! RECIPE! I added a tablespoon of my homemade almond butter and some maple syrup. So good. Not pictured is the nectarine I also ate with it. I can’t eat real close to running time, so I made some lunch around 3:30-ish. Paul’s parents had been here the day before so we had sandwich fixings. I don’t usually eat sandwiches. I love them, but I always feel like I finish them too quickly. I’m all about having a huge plate full of food. Salads are better that way. Anyway, I had some veggie turkey and my home pickled sweet pickles and lettuce on a lavash with veggies (the tomatoes are from Paul’s parent’s garden!) and hummus. Good stuff. As the run came closer, I had to get our stuff together. Camelbaks, Gus, and a sodium shot. What’s a sodium shot? 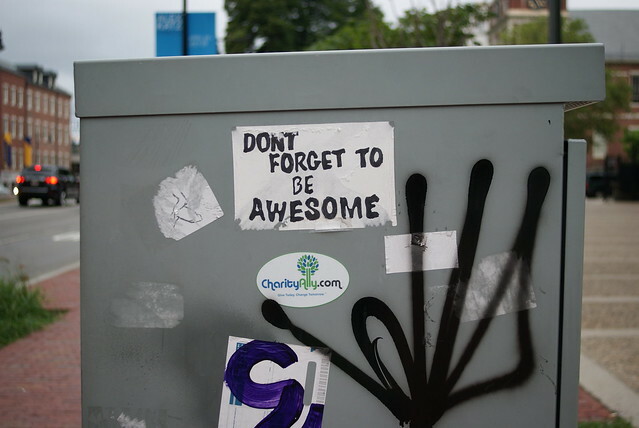 It’s awesome, I’ll tell you that. I’m going to dedicate a whole post to them at some point. I’m surprised you can’t see the stink lines coming off of my camelbak, actually. I am not dainty. It’s since been washed, though! I only went through one of the Gus on the twelve mile run. What a run, too. As soon as we left the house, it started pouring, with thunder in the distance. We waited ten minutes, and it looked like it was letting up so Paul was like, “hey let’s just go.” So we did, and it started pouring again! For the first mile and a half or so. Then it lightened up some. And there was a rainbow! It was awesome! Awesome except for my soggy feet. Twelve miles in waterlogged socks. Imagine the blisters. Okay, now imagine more of them. Ugh. Anyway, we made it! And I came back inside and was ravenous. Which is weird, because my long runs have been leaving me nauseated for hours up until now. It looks like my stomach is getting used to long distance running! Go stomach! This is stuff that I ate before my shower. 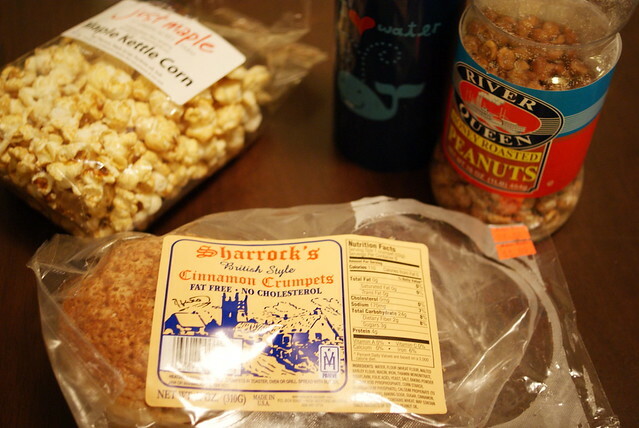 Honey roasted peanuts, a crumpet, and some maple kettle corn. Oh and water! Shower and stretch before dinner time. Dinner was easy, pita pizzas! 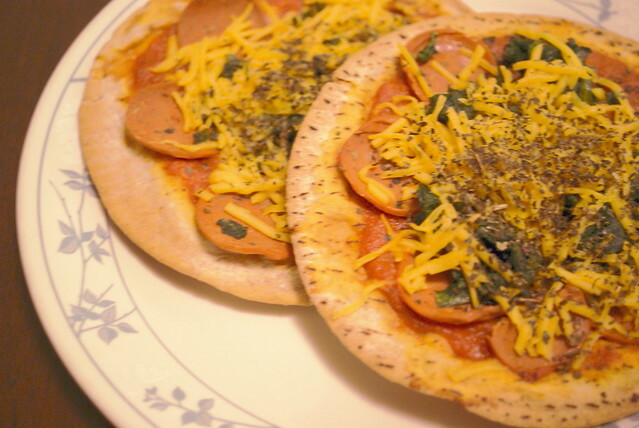 With veggie pepperoni, spinach, and vegan cheese. Pretty yummy! Once dinner was over, I still had about 1400 calories left to eat for the day. Crazy! So Paul and I went to Walmart (the only thing open late in New Hampshire) like a couple of stoners on a mission. Junk food! 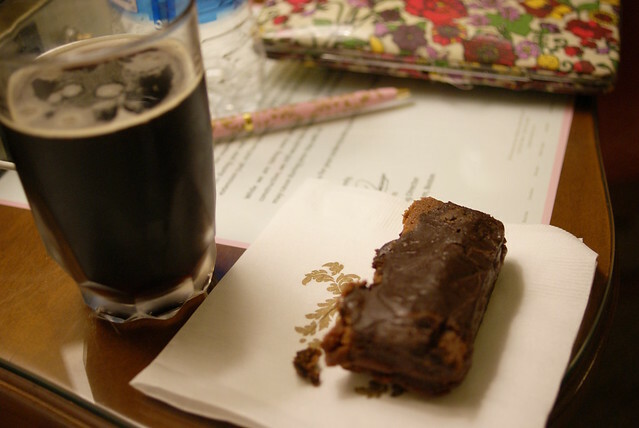 We actually wanted to get decadent tofutti ice cream bars, but Walmart… you know. So, cookies and candies it was! Disclaimer: we didn’t eat all this. Actually, we didn’t touch the chocolate and Paul brought most of it into work the next day for the vultures to eat. 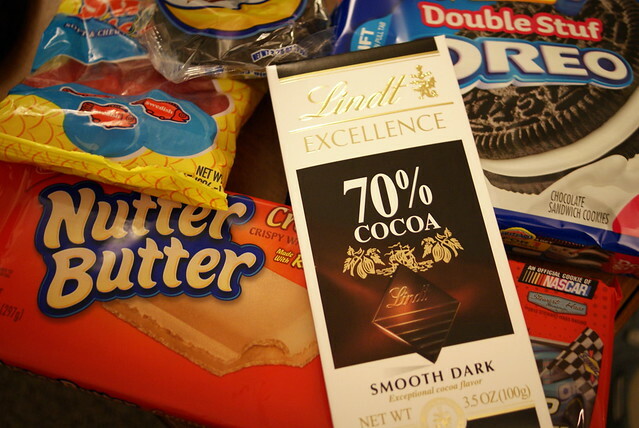 But it felt good to buy a bunch of junk food. 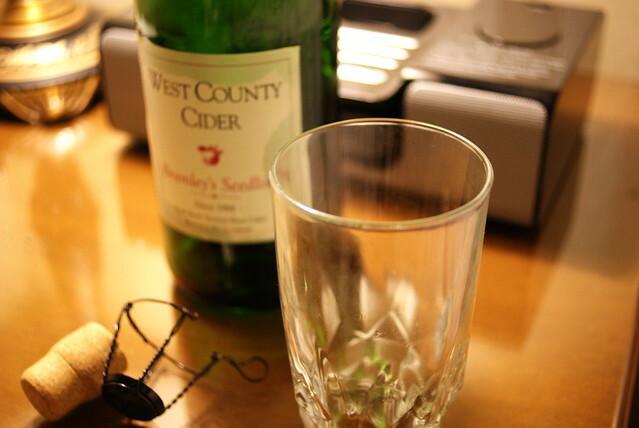 Before bed we also shared a bottle of cider. 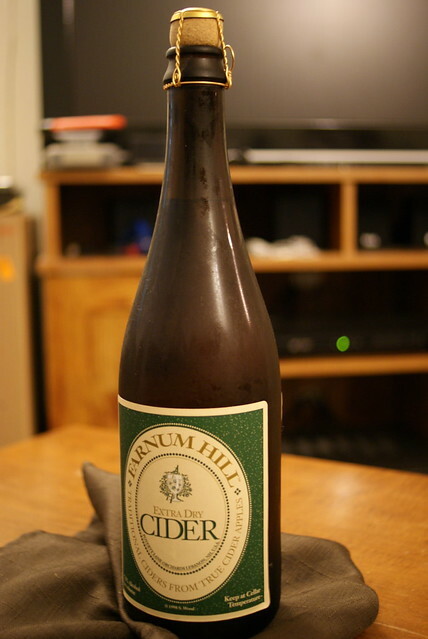 Mmm, cider. So yup, that’s what I eat when I run twelve miles. Categories Cooking!, Drinking!, Running, What I Ate Wednesday! What I Ate Wednesday – Birthday Edition! Hey I had a birthday not long ago! I’m 31! My birthday was actually at the end of July, so this is a bit late. But anyway. My birthday day was very relaxing. I went on a 3.1 mile run for my 31st, which is something I want to make a habit of for birthdays to come! Paul came home with a bag full of goodies from Cafe Indigo, like really a bag full. We shared a piece of vegan fudge before going out to eat sushi. After sushi we headed to a bar that I had heard has many beers on tap, and then we went galactic bowling! I haven’t been bowling in years. I’m still terrible at it, it seems! But this What I Ate Wednesday is about what I ate the day AFTER my birthday! Paul and I headed down to Boston, with plans to stay at a swanky hotel and go see a play in a park in Chelsea. We woke up late-ish and had breakfast. 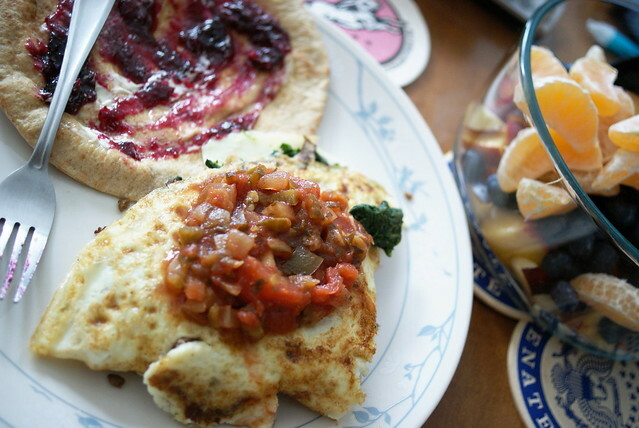 Judge me if you want, but I eat egg white omelets sometimes. Paul makes really good omelets, what can I say. This one had spinach, sauteed mushrooms, and vegan cheese in it. We had toasted pitas with homemade blueberry lime jam (more on that tomorrow!) and fruit salad. The plan was to walk in the direction of Veggie Galaxy in Cambridge. I am obsessed with this place, they have the most amazing food and I have to eat there every time we’re in Boston. We made it about a mile before it started raining. I saw this shortly before getting on the T.
So it started POURING! Stupid us, we brought umbrellas with us, but didn’t take them on our walk. Of course, a little corner store had some for us to purchase. We made it to Veggie Galaxy mostly dry. And then we ate so much. We skipped the vegan frappe this time, sadly. It is so delicious but so filling. 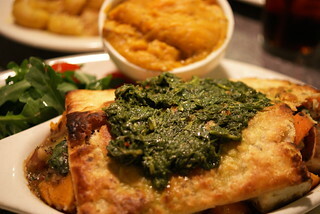 I ordered the Vegetable Pot Pie with smoked tofu, covered in pesto, with mashed sweet potatoes and arugula. We ordered a kids portion of the vegan mac and cheese because it is too good to not order. It had to be done. 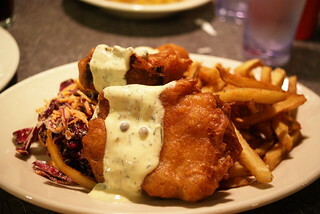 And Paul had the Beer Battered House Smoked Tofu, which came with red cabbage slaw and the most delicious black pepper french fries. I mean, how awesome does this food look? It tastes even better! They even make their own ketchup. Seriously. Love you, Veggie Galaxy. After eating, it was still raining. We made it over the Charles river, but not without getting drenched. So, we decided to pick up some booze, get a cab back to the hotel, and just relax for the night. We spent the rest of the night curled in our bath robes, watching the olympics. That was a fine birthday for me! Categories Cooking!, Drinking!, Eating Out!, Running, What I Ate Wednesday! 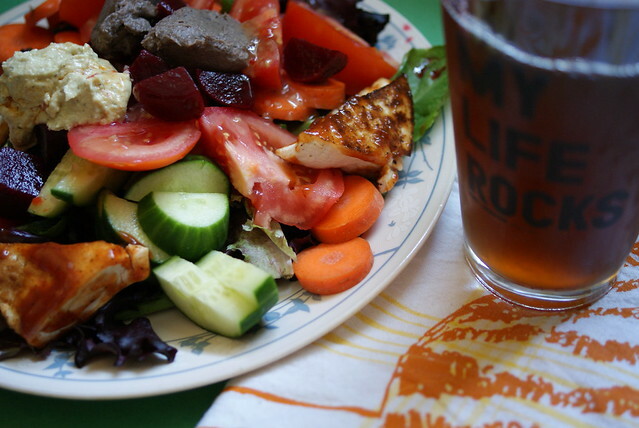 What I Ate Wednesday – Cool Slaw Edition! 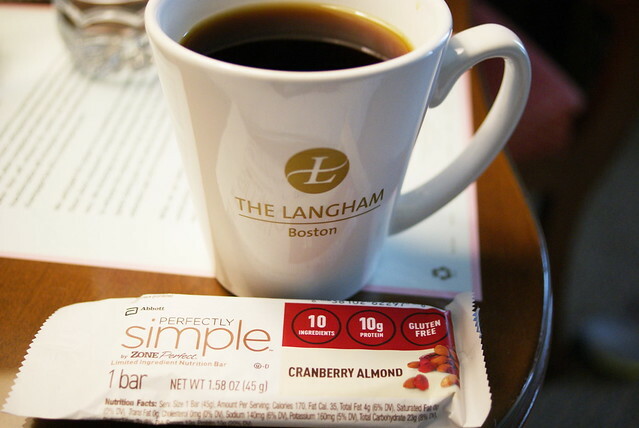 Hey Happy What I Ate Wednesday! This is what I ate yesterday! Happy What I Ate Tuesday! My food was not all that exciting on Tuesday, but it was pretty tasty. I started work at 8 instead of my usual 9am start, since I was quitting earlier to go to a doctor appointment. I woke up and scarfed down some Ezekiel toast with chunky natural peanut butter and a smoothie made with mixed tropical fruits, plain unsweetened almond milk, vanilla brown rice protein powder, and stevia. Good stuff! Around midmorning I got really sleepy and not so great feeling. I sort of moped around for a while until lunchtime. Guess what? I ate a salad! Yep, I always eat a salad. 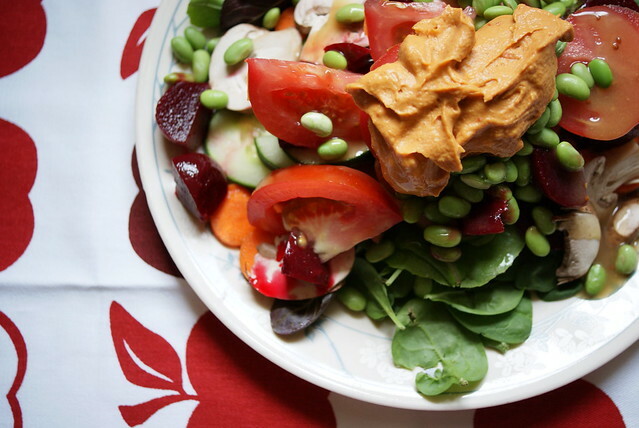 This one had lots of veggies, edamame, and red pepper hummus. I picked up a random tub of hummus at the not-so-great grocery store across the street and I think I might throw it out. Not so great. I went to my doctor appointment and didn’t really think I’d be out long. But I ended up sitting in the waiting room for a long time, which was no big deal. Like three ladies were in labor. I wasn’t in labor. I can wait! When I got home though, I was hungry. I had a run coming up, albeit a short one, so I had some fruit to try to keep my belly calm. 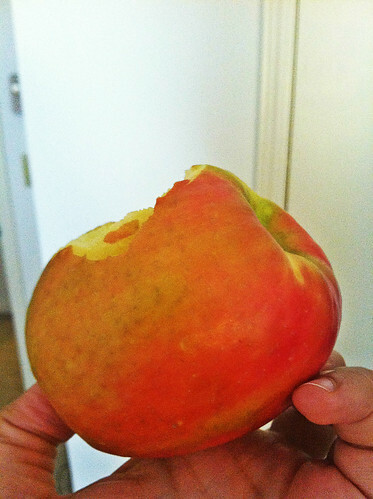 Nectarines are so good! I forgot to take a picture of my pre-run coconut date roll. Whoops! Paul and I ran our short three miles at around 7. I felt like I was working way harder for the speed I was going at. But it was super windy and wind makes me breathe funny. We both felt, well, winded when we were done. But we got it done and that’s what counts! Tonight is five miles. Whoop whoop. After watering/fertilizing the garden, we came in to make dinner. I had this idea that portobello mushrooms and guacamole would go together well, and Paul wanted cool slaw. I hadn’t made cool slaw in a while, so we both got what we were craving! So we grilled portobellos, sliced them and ate them in pitas with guacamole, lettuce and tomato. Yum! The cool slaw was awesome both on the side, and tucked inside the pitas Baha-style. You might be wondering what cool slaw is. Well, it’s only the most awesome low-fat vegan coleslaw recipe around. It’s Cool Slaw! 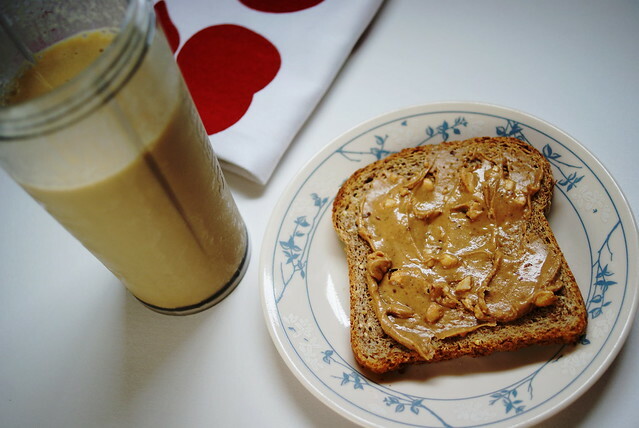 Add the drained cashews, water, shallots, vinegar, mustard, agave nectar, salt and pepper to a blender. Blend on high until the mixture is smooth, scraping down the sides with a rubber spatula if needed. 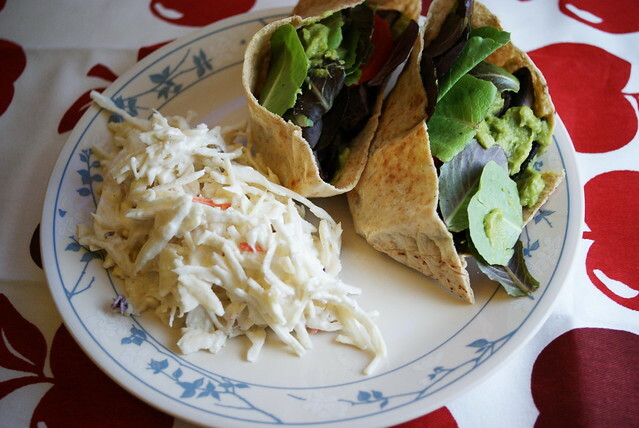 Combine the coleslaw mix or cabbage to a bowl, and add the dressing from your blender. Mix well to combine. Add Vegenaise to taste. So good! I like the recipe without the Vegenaise, but with it is a whole ‘nother level. But I put Vegenaise on lots of things, so. Blush. So there we go. 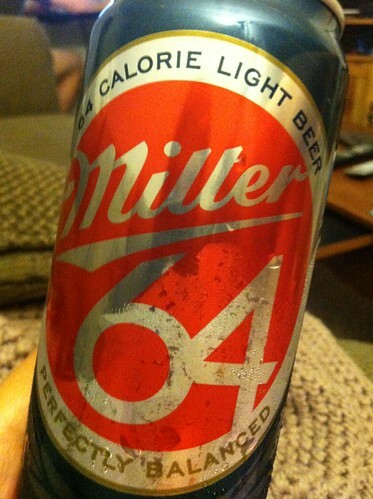 I capped the night off with a skinny person beer. Vegan Quiche, Blueberry Picking, and Parents! So, last Wednesday, for What I Ate Wednesday, I posted a picture of the vegan quiche lorraine that I made for dinner. 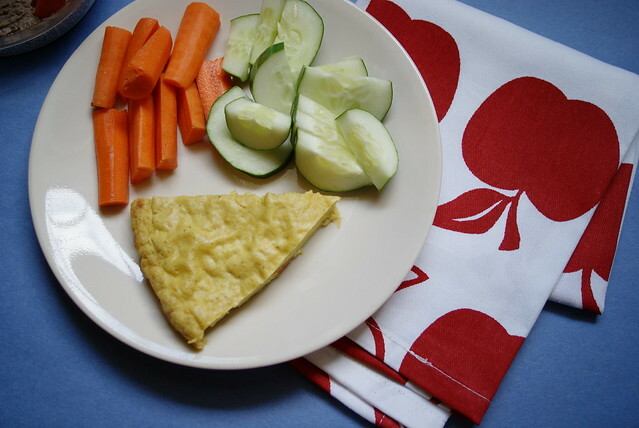 I used to love the quiche that my Nannie (that would be my mom’s mom) used to make. She made the most delicious and buttery pie crusts, and her quiche was always perfect. It was filled with eggs, cream, swiss cheese, bacon, and with tomato slices on top. I always really liked the slightly dehydrated tomato slices. I could eat pretty much none of that anymore, but this crustless vegan quiche is a nice substitution. I didn’t put tomato slices on top, but I will try that next time around! 1) Preheat your oven to 375F, and spray a 9″ springform pan with cooking spray. Set the pan aside for later. 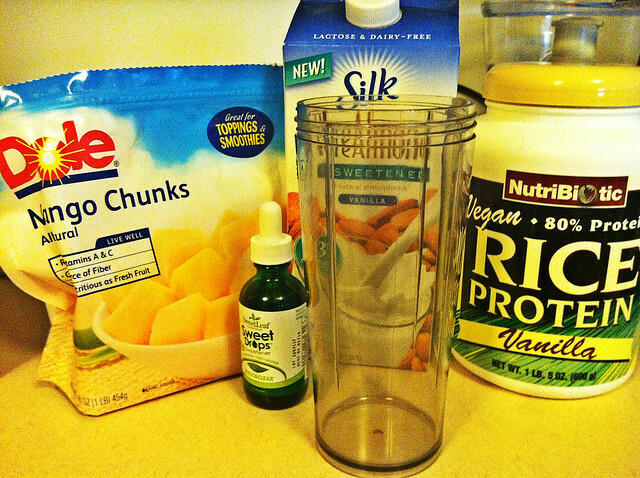 2) Place the first eleven ingredients in a blender and blend until combined and smooth. Using a spatula to scrape down the sides, empty the mixture into a medium sized bowl and set aside while you assemble the remaining ingredients. 3) In a medium sized frying pan, heat the canola oil over medium-high heat. Add the onion and the sausage and cook them for 3 or four minutes. Add the garlic and cook until it’s fragrant, don’t let it burn. 4) Add the onion-sausage mixture to the blended tofu mixture and stir well to combine. 5) Transfer that mixture to your prepared springform pan, and cook in the preheated oven for about 40 minutes. If you toothpick test the middle, it should come out clean. Let it rest in the pan for about ten minutes, then remove from the springform until ready to serve. 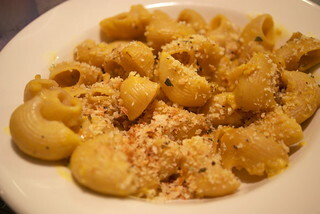 I served it at room temperature and warmed up, and they were both delicious! This weekend was another really nice weekend! Paul and I took a journey back into New York on Friday to spend the weekend with my parents. Vermont was right these standing between us and New York, and when we drove through the Quechee Gorge area, we decided to stop and look around. 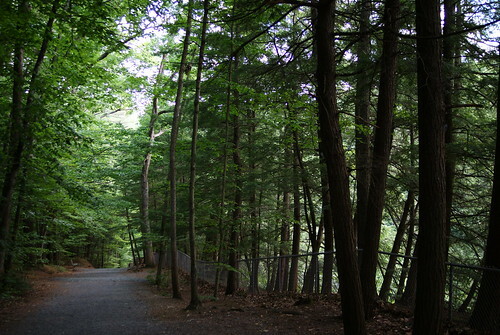 It’s a very nice area, with a wide trail going down to the bottom of the gorge, and what looked like well-blazed trails off of it. I think I’d like to go back there for more exploring. On Saturday, Paul, my mom and I went to Schuylerville. We drove up to the cemetery where my Nannie and grandpa are, since I haven’t visited in a while, and walked around the town a bit. 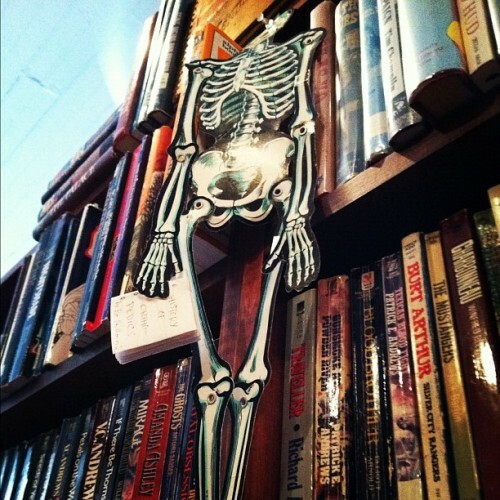 There are a few really neat stores in this super small town, especially thrift store and a used book store. I got a nice polyester flower print shirt with ruffles on it, and copies of Viktor Frankl’s The Unconscious God and Anton Chekov’s The Cherry Orchard. I love me some Frankl. And some Russian authors. He’s reading The History of Orthopedics, of course. She filled up her bucket at least ten minutes before Paul and I filled the one that we were working on together! Geesh! Here’s our stash. 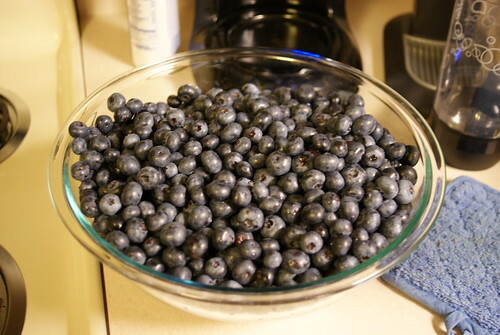 Paul’s “letting” me make a small batch of blueberry jam with them, but he mostly wants to cram them into his face unaltered. The last thing we did on Saturday was run. We were scheduled for a nine mile run based on our half marathon training. My farthest and longest run ever! It was not pretty, let me tell you. But I did it! My parents have a mile loop around their neighborhood, so we ran that nine times. It was funny, and we got encouragement from other people in the neighborhood as we kept going around and around. But man, old and compact asphalt is hard. And afterwards, I felt so weird. It took an hour and a half or so for my stomach to be able to handle more than little sips of water or chocolate soy milk (this will definitely never be my after-run food of choice). Paul is much more used to the long runs than I am. Well, he’s done them before because he ran a marathon a few years ago. So he hit his groove during this run. Afterwards, while I’m rocking back and forth wondering whether or not I’m going to be spending the next little while with my head in the toilet, he’s pouring himself a big glass of wine! Ugh! Anyway, I recovered and became so ravenously hungry. Good thing we had picked up food from Antipasto’s, which has some of the tastiest vegan and vegetarian Italian food in the capital district. Granted, there’s not a lot of choices, but this is still a solid one. I would have taken a picture of my tofu parmesan (the Paul McCartney, as Antipasto’s calls is), but I was busy rocking back and forth post-run. Whoops! Hey! I’ve always liked going through random What I Ate Wednesday posts, so I thought I’d get in on the fun! It hurts my brain a little that What I Ate Wednesday is not always things that people ate on Wednesday, blogged about on Wednesday, but rather things that people ate one day of the week, posted on Wednesday. I get it, I get it. Anyway, here is what I ate on Wednesday! Food AND Fitness this month? Well you don’t say! Those are my favorite things! Yup, pretty simple. I love my Nutribiotic protein powder. I’m curious about Sun Warrior, though, so I might try that when this tub is finished. 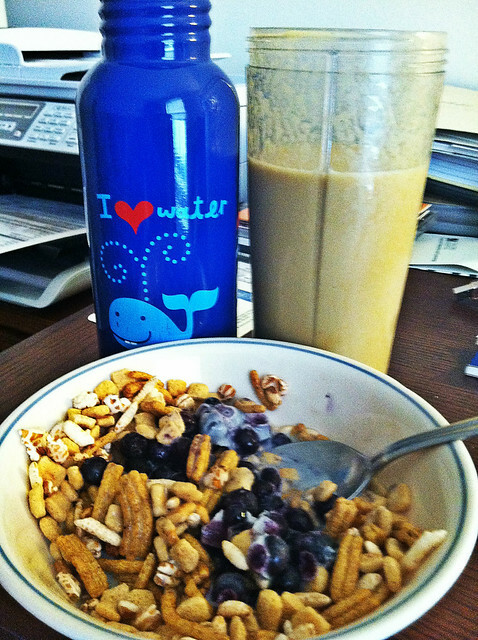 Smoothie and a small bowl of Kashi Go Lean with frozen blueberries and unsweetened vanilla almond milk. I’d rather be eating some sugary kids cereal, but you know. Health! Go Lean is actually pretty tasty. And my breakfast water! Water before coffee! I had an apple as a snack a little later. 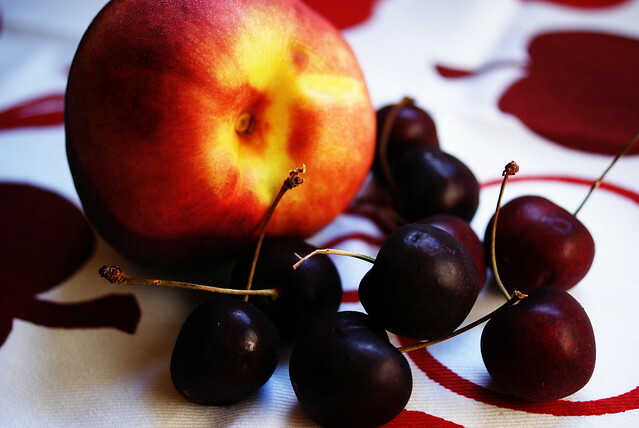 I try to only snack on fruits if I get hungry between meals. I almost forgot to snap a picture! Lunchtime! I usually have a salad for lunch. My salads are INTENSE. I’m actually running low on veggies at the moment, but I made do. I topped it with dry-fried tofu (the BEST way to make tofu) that I had covered in a little bit of barbecue sauce, and two kinds of hummus. Lentil and black bean! And I had a glass of diet arnold palmer. Yep, my life rocks. No, I didn’t eat a bag of Gushers. 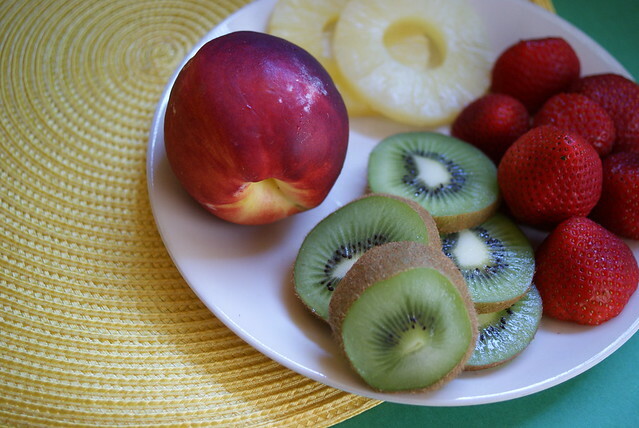 Just a plate of delicious fruit. Nectarine, pineapple (I opened a can just for the juice to use in a recipe last night, so we’re working our way through pineapple rings), kiwi and strawberries. It was sad to leave the other fruits off of my plate. Too many fruits! As for the fitness, today was a longer short day – 4 miles! Yesterday we had our planned short three miles, but the skies opened up and we worked on our sprinting to get back to the house. So we only got two miles done. But! The first mile was my fastest continuous (not speed work) mile ever! Whoop whoop. Today, however, I just wasn’t feeling it. I had a crummy day at work and all I wanted to do was roll around on the couch doing the woe is me type deal. But I did get out and run four miles. Not my fastest time ever, but not my slowest either. Coming back into the house, all we wanted to do was scarf down the dinner I had made. Paul had a work meeting all day with a catered lunch and didn’t get any veggies. So he requested salads. I already had my salad for the day, but another one wasn’t going to hurt me. I had made a vegan crustless quiche (with homemade vegan sausage!) earlier in the day, and I was really craving one of the two egg rolls left in the fridge. What a weird dinner. The quiche was awesome, though, and I will post more about it later. And to end out the day, I bought presale tickets to see The Afghan Whigs at the House of Blues in Boston in September. It’s sixteen days after I have my second and last surgery for the year, so I hope I’m up to it. Ohh dear, Greg Dulli. That’s my day! What I Ate Wednesday is exhausting! Categories Cooking!, Running, What I Ate Wednesday! Rest days are turning into restless days. I feel weird when I’m not running. And even though it was a scheduled rest day and I tweaked my left ankle yesterday and it was about a million percent humidity today, I wished I was running. I guess that’s the way things go now! I’ve been occupying myself with gardening, Breaking Bad, furniture assembly, and obsessively checking the Badwater Ultramarathon splits table. While running Badwater is not something that I’d ever really want to do, I can’t not admit that the people racing are complete badasses. But I never thought I’d be running at all, so who knows. The other day Paul and I were discussing marathon and beyonds. If I can push a marathon out of me (hopefully next year), I can probably get through a 50 miler or so at some point. My body does all sorts of things I’d never imagined! But I have to keep it fueled. Aside from the milk allergy, I have a very sensitive belly. My very sensitive belly does not take well to certain foods before a run. i found out, the hard way, that bananas before running are not for me. But everyone says they’re a great pre-running food! Why am I so weird? So I had to find another source of carbohydrates for a quick snack an hour or two before i run. So I switched to dates. 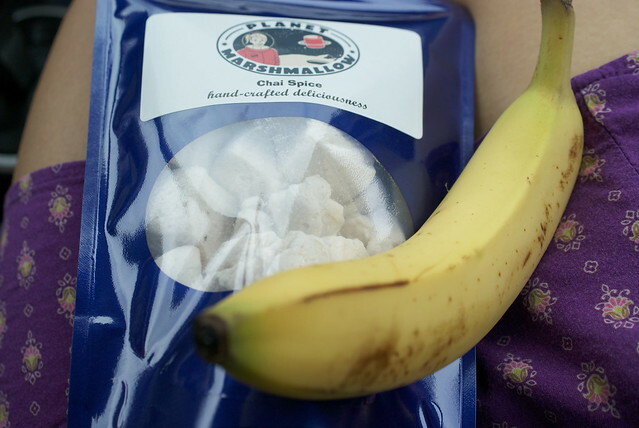 They have carbs and potassium just like bananas, and they don’t make my belly hurt! Great! But I got bored. So I bought these delicious date rolls from my local co-op. I got maybe five of them in a container, and paid a pretty penny for them. So I thought, I could create my own. And so! This one’s easy. Add the dates, almonds, and 1/2 cup of the coconut flakes to your food processor. Process until it forms a big, sticky lump. It’ll take a few minutes, don’t be discouraged if it doesn’t look very sticky at first. If your dates are particularly dry, you might have to add a couple of tablespoons of water. Once it’s done processing, form the dough into ping pong ball sized balls. I get between 15 and 18 at a time. 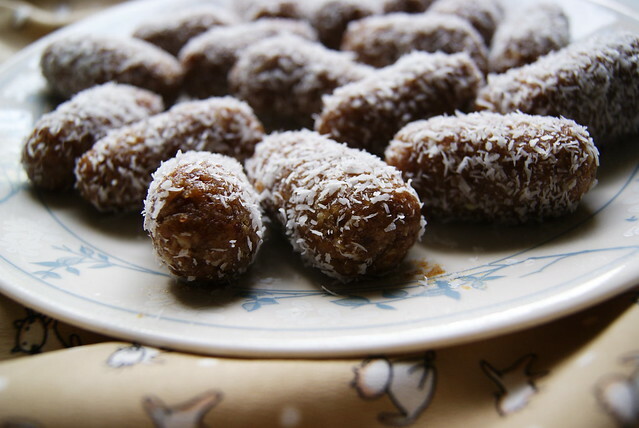 Roll those balls between your hands to form a log, and roll that log into the reserved 1/4 cup of coconut. That keeps the rolls from sticking together when you store them! Keep the rolls in the fridge! I keep them in a pyrex container, and they last at least two weeks that way. I eat one an hour and a half or so before running, and they’ve done a good job of keeping me energized without tummy upset. 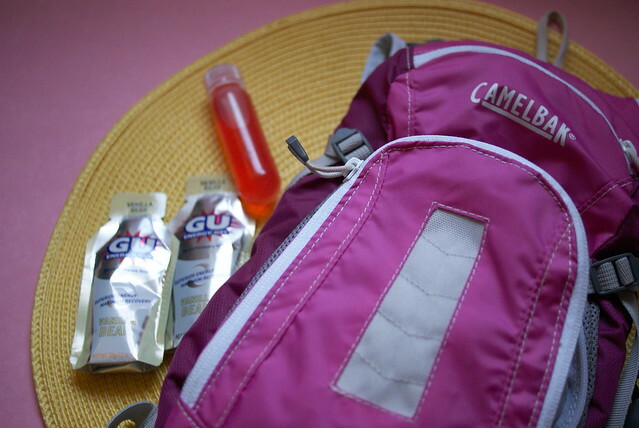 I haven’t tried keeping them in my pack for quick energy in the middle of a run, but I might try that instead of a Gu pack next time. I do love my vanilla bean Gu, though.